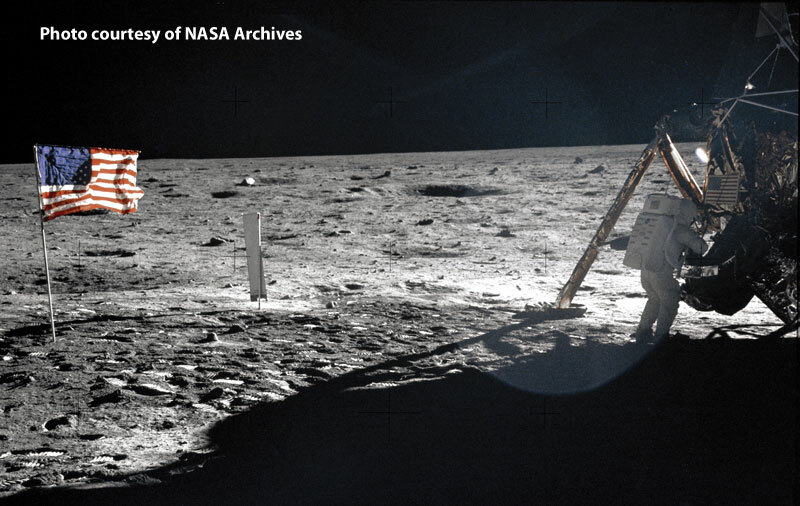 To his vast audience, Armstrong became instantly memorable by being the first man to set foot on the moon. That incredible feat, made even more glorious by his famous (and perhaps garbled) statement, “that was one small step for (a) man, a giant leap for mankind,” left an indelible impression. The inclusion or exclusion of the parenthetical “a” has long been a subject for debate. Armstrong himself preferred that it be included. To those who worked with him subsequently, and who came to know his career more intimately, he was of course also memorable for that “small step.” But the regard in which he was held by his colleagues was much greater for a wide variety of reasons, all consistent with his persona. Armstrong was profoundly intelligent, confident, extremely aware of what and how he wished to contribute, and totally indifferent to outside pressures. A lesser man might have succumbed to offers that promised him political positions, for even an attempt at the presidency was certainly within his grasp. He might have been tempted by unlimited income and positions of tremendous industrial influence. And of course, he was continually exposed to the greatest narcotic for those who achieve sudden prominence in some great event, continuous prominence in the media. 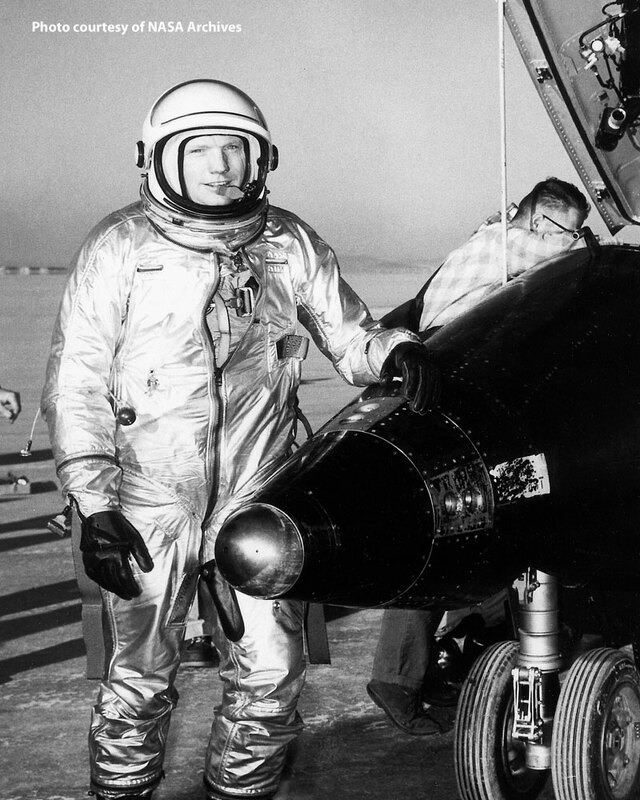 To go from flying Panthers to the X-15 was a giant step for a pilot, but one of which Armstrong was fully capable. Neil Armstrong was perfectly aware of his fame and the regard in which he was held. But unlike many in a similar position, he saw the hazards, as well as the perquisites, of his celebrity status. One of his greatest and most endearing personal attributes was his ability to maintain his privacy, to avoid interviews, and signing autographs. He did so with a smiling graciousness that left everyone feeling good about the situation. Even the briefest examination of his life shows that long before he became internationally famous as the Command Pilot of Apollo 11, Armstrong used the same personal characteristics of competence, selectivity, and confidence to guide his life. In love with aviation, and a Lieutenant with 71 combat sorties at the age of 22, he may well have had a brilliant career in the Navy. Instead, he opted for more education to enable him to become an experimental test pilot. He obtained his degree in aeronautical engineering from Purdue in Armstrong fashion— by getting good but not sensational grades, enjoying campus life, and setting the stage for his 1956 marriage. Following his own plan, Armstrong took employment at the National Advisory Committee for Aeronautics’ Lewis Flight Propulsion Laboratory. He knew it was the right route to becoming a test pilot at the High-Speed Flight Station at Edwards Air Force Base. There he learned the business quickly, flying many of the top aircraft of the time, including the North American X-15. It was inevitable that Armstrong’s flying career would have its share of hazards, from being forced to eject from a shot-up Panther in 1952 to difficult landings in both the Lockheed F-104 and the X-15. These experiences undoubtedly polished his reflexes for the most critical landing of his life in the Lunar Lander. The cliché “the rest is history” might have applied to anyone but Armstrong, who wore the laurels of Apollo 11’s success with grace and dignity throughout his life, never once exploiting them for his personal needs. So, among the professionals who worked with Armstrong in the 43 years, he is remembered for much more than making the first successful moon landing. He is equally well regarded for his loyal dedication to his profession, his important contributions to the investigation of the Space Shuttle Challenger’s crash, and his unfailing loyalty to his fellow astronauts. There were no formalities in working with Neil; he could joke and laugh with the next man. The recipient of almost innumerable great honors himself, he took the great pleasure in introducing fellow astronauts to similar acclaim. If, for example, they were being inducted into the National Aviation Hall of Fame, Armstrong would gently roast them with some humorous anecdotes before highlighting the real reasons for their selection. After his great experience in 1969, all Neil Armstrong asked of life was to live it as he had done before, making the best choices for the use of his time and skills. His only request was to allow him to function at his best without the distractions of being a celebrity. He did this with memorable grace and good humor, further distinguishing an amazing career. And so it was not the single moment when became world famous as the first person to set foot on the moon that defined Neil Armstrong. Instead it was his steadfast devotion to his own standards of research, conduct, and patriotism that made him a man for the ages.